I was part of a discussion over the past few days on WattsUpWithThat, that started out (the primary topic) discussing Obama's statement that within 5 years, the US would have a car battery that would achieve 130 miles per gallon. While that is a non-sensical statement from an engineering standpoint, it was made by a career politician who is also an attorney - that is, he has zero background in this. He did refer to Energy Secretary Chu, a Nobel-prize-winning physicist who should have known better than to make such a statement. However, it is possible that Obama got it wrong and mis-quoted Secretary Chu. Batteries contain what is referred to as amp-hours, not gallons, and the amp-hours are available at a certain voltage (within a relatively low tolerance). That is, the battery's voltage will decline somewhat as the battery is discharged. Standard car batteries in the US operate at 12 volts, nominally. Electric car batteries operate at far higher voltages, and this varies depending on the manufacturer. At some point in the commentary on WUWT, nuclear power plants were brought up and their virtues were extolled. I, of course, stand ready to refute any and all such extollations because nuclear power is about the worst way to generate electricity known to man. As support for my proposition, I cited two studies, one being the excellent analysis by Craig A. Severance, CPA, where he produced results that show a new US-built nuclear power plant must charge 25 to 30 cents per kWh in order to pay for the investment plus operating costs. Unfortunately, that paper does not appear to be available on the internet at this time. Even then, Severance's number is too low because it did not reflect the subsequent US requirement that all new nuclear power plants be designed and constructed to withstand a direct hit from a large commercial aircraft. Furthermore, the new plants must be designed so that not only the containment building is intact, but also the cooling system and the spent fuel storage area. I have stated that this requirement should add another 5 cents per kWh to that calculated by Severance, thus bringing the cost to 35 cents per kWh. The second study I cited, since the doubters in the comment thread demanded "proof," was from the California Energy Commission, a state agency, and their published comparison of multiple generating technologies for both 2009 and for 2018. The report is "Comparative Costs of California Central Stations Electricity Generation" dated January 2010. One of the technologies is a single reactor, Westinghouse AP-1000 design that produces 960 MW. Their assessment also concluded that a merchant nuclear plant's levelized cost of electricity is 34 cents per kWh. They also assessed Investor Owned Utilities and Publicly Owned Utilities, with costs at 27 and 17 cents, respectively. The WUWT commenters of course disagreed, and cited some other studies giving the cost of power from new nuclear plants at 3 to 6 cents per kWh. This is, of course, ludicrous. 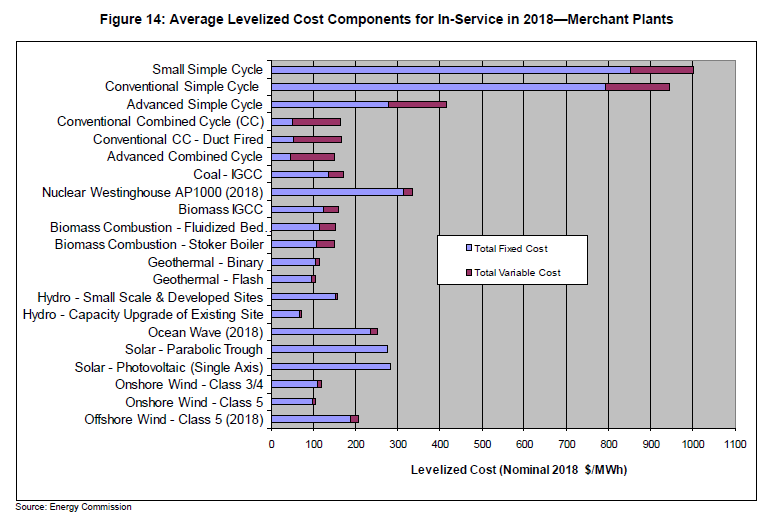 Anyone with the slightest background in cost estimating and financial analysis will conclude that no project can be built without massive subsidies that costs $8 to $10 billion, requires 4 to 8 years construction time, and produces only 1000 MW electricity at maximum output, plus relies on sale of electricity at 6 cents per kWh. One must bear in mind that the plant also must shut down periodically for refueling and will incur other operating problems that curtail generation. Therefore, over the long term, the 1000 MW will be derated to approximately 850 to 900 MW. There are several key points to keep in mind about the true costs of nuclear power. First, what is the cost of the design, materials, services, equipment, and labor to construct. This would be the "instant" cost, that is, if it could all be built in a single month, what would it cost? Typically, the instant cost is approximately $4 billion for a 1000 MW plant. California Energy Commission (CEC) used $3.95 billion for 960 MW. But, of course a nuclear power plant cannot be constructed in a single month and will be built over a period of several years. The longer the construction schedule, the more that two other items become important: materials and labor inflation, and financing costs. The great debatable item is the time to construct. Nuclear power proponents insist that new plants will be built in only 4 years, or 48 months from groundbreaking to first generation. This has never been the case in the US, and indeed throughout most of the world. Typical for the US is 7 to 10 years, and some lasted much, much longer. Even in Europe, the plant being built in Finland is years behind schedule and has issued no expected completion date (see second half of my article at this link). As the construction period increases, so too will the costs of materials and labor increase due to inflation. Nuclear power plants require great quantities of concrete and steel, which are subject to cost inflation. Also, each year that construction continues adds a higher and higher amount of interest on the financing costs. For a large nuclear project, it is common for the financing interest alone to reach $1 billion per year in the latter years of construction, especially for a two-reactor plant with both reactors proceeding at the same time. Another key aspect of a nuclear power plant being constructed is the need to reassess the design and incorporate any lessons learned from recent disasters or mishaps from the approximately 400 operating reactors around the world. This is frequently cited by nuclear advocates as the key reason plants' costs spiraled out of control in the 70s and 80s, and they insist that such days are behind us and nuclear power plant design is now mature. This is not the case, as the recent disaster at Japan's Fukushima nuclear complex clearly demonstrated. That disaster was the result of two almost-simultaneous events, a large earthquake and a large tsunami a few minutes later. Many nuclear advocates point to the land-locked sites of nuclear power plants in the US and concluded that they are perfectly safe because a tsunami cannot possibly reach them. However, a recent earthquake on the East Coast shook at least one nuclear power plant and the structural damage is not yet clear. The simple fact is that we do not know how to predict the largest earthquake that could strike. We could design for an earthquake of magnitude 7.0 and then experience an earthquake of 8.0 or even 8.5. Also, earthquakes are not all the same. Some shake the ground from side to side, others have more vertical shaking. Some are a combination. Designs for such earthquakes are very complex. Yet another key aspect of new nuclear power plants is the intense opposition by well-funded groups that bring lawsuits to halt construction. The anti-nuclear sentiment is very strong around the world, and in the US. The memories of the faulty construction, gross abuses during construction, and sheer incompetence of some project management from the 70s and 80s is still very fresh. If the next round of nuclear power plants also has the same shoddy workmanship, intimidation and threats to inspectors and auditors, the advent of the internet will ensure rapid whistleblowing. Delays will inevitably result. Furthermore, it can now be shown via various studies that new nuclear power is not a cost-effective means of generating power (see Figure 1, below). It can be argued that the state governing boards must agree to power projects that provide safe, reliable, and low-cost power to the public. Nuclear power does not fit those criteria. Finally, nuclear power plants consume far more water per unit of electricity produced than almost any other technology. The reactor must be kept cooled, and the steam from the turbines must be condensed. A nuclear plant will deliver approximately 3 times as much heat into cooling water as is delivered as electricity. In contrast, a natural gas-fired combined cycle gas turbine plant will use approximately one-fourth of that cooling water. Stated another way, the nuclear plant will require 4 to 5 times as much cooling water. By cooling water, the meaning here is water that is evaporated in the heat removal process. For all these reasons, nuclear power plants should never be built. There are far safer, more cost effective, and less water intensive means of producing electricity for the future. Thats $420,000,000 sales per year. 21B over the life of the plant. Minus construction cost of 10B = $11B over the life of plant for operations and more importantly profit. So why do you need $0.35 kw-h to make a profit? Mr. A. Mous, I am not certain if your question is serious, or in jest. On the assumption it is serious, I direct your attention to any of several sources on major infrastructure financing mechanisms. What your question appears to overlook are 1) the time value of money, especially the investment, and 2) the cost to produce the power. An investor knows the time value of his money, and will require at least a 5 percent return on his investment, which is $500 million per year for interest alone. More likely he will require at least 10 percent. Since a nuclear power plant is worthless when it is deemed unsafe and worn out perhaps 40 years after startup, the investor will also want the return of his $10 billion. The plant must produce sufficient revenues to pay back that $10 billion also. For round numbers, figure another several million per year for that. Next, the power costs approximately 3 cents per kWh to produce, so from your example, half of the $420 million is used to produce the power.